Ia is a warrioress from the dimension/world of Glibliax and an ally of the Ninja Turtles during the Triceraton invasion of Earth. Ia originates from an unknown world named Glibliax. While nothing is known about this world, it appears to be highly advanced, since Ia is seen operating advanced technology (including Triceratontechnology) with practiced ease. Ia was one of the many hopeful warriors to enter the Battle NexusTournament and fight for the title of Battle Nexus Champion, the greatest warrior in the multiverse, at the same time that the Turtles first competed in the games as well. Though unseen during the preliminaries, she was witnessed defeating Krall in the first round andDieskrad in the second. Ultimately, however, she lost toMichelangelo in the third found. She later joined Traximus’ rebellion during the Triceraton’s invasion and occupation of Earth. Ia was last seen sparring against Dieskrad and Zat during a pre-fight exhibition at Michelangelo’s grudge match with Kluh. 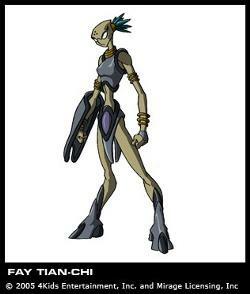 In the 4Kids production blog, it is shown that she was originally given the name Fay Tian-Chi.